There are several things about Islam that deserve honor and respect by all people of good will. People of the Book, Jews, Christians and Muslims, all have sacred Scriptures. And if those unfamiliar with the Koran would read it, and the Bible as well, they would find amazingly similar material and universal values and truth. The Koran is one path to the Universal. People of the Book have various spiritual disciplines. One is fasting. Several years ago I decided to fast with some Muslim friends during their month long fast of Ramadan. The tradition is that you do not take food or water from sunrise to sunset. You can break the fast after sunset and take food and water before the sun rises, (should you want to get up that early). I had engaged in fasts many times in the past. The longest was a nine day, water only fast, that I intended to do for four days, but extended twice for new and different reasons. A couple of years ago a friend and I started a Fast for the Care of the Earth that became international in scope through social media and the internet. It went on for two years with people signing up for a day or two from all over the globe. I fasted once a week during much of that period. So I'm no stranger to fasting and it's origins in Christianity. But I was a stranger to a daily fast, regulated by the light of the sun, that so radically changed my behavior patterns. All went well for the first three days. On the fourth day I got up late and missed my water intake. My thirst was intense by sunset. That same day I watched my family eat dinner, again, as the sun sat, seemingly unmoving, in the sky. On the fifth day I told my friends I now realized I was not a Muslim, they laughed, and I broke the fast. It was a learning experience for me. Although most religious traditions recognize fasting as a universal spiritual discipline, the paths for getting there are often different. My appreciation and respect for the Muslim practice of fasting during Ramadan was increased, having tried it myself. Which brings me to some of the other things I honor and respect in Islam. One of the five pillars of Islam is Pilgrimage. Every able Muslim is expected to make a pilgrimage to Mecca at least once in their lifetime. I honor and respect this in Islam. Pilgrimage is about transformation and these once in a lifetime experiences can lift people out of the mundane routines of daily secular life and drop them in the sacred waters of spiritual renewal. All who claim a religious identity would do well to make periodic pilgrimage to a sacred site. On my bookshelf are two volumes of an encyclopedia of pilgrimage sites around the globe, "Pilgrimage: From the Ganges to Graceland." Would I had purchased the volumes years ago and been to several. A few years ago a German friend gave me a shell to wear around my neck. 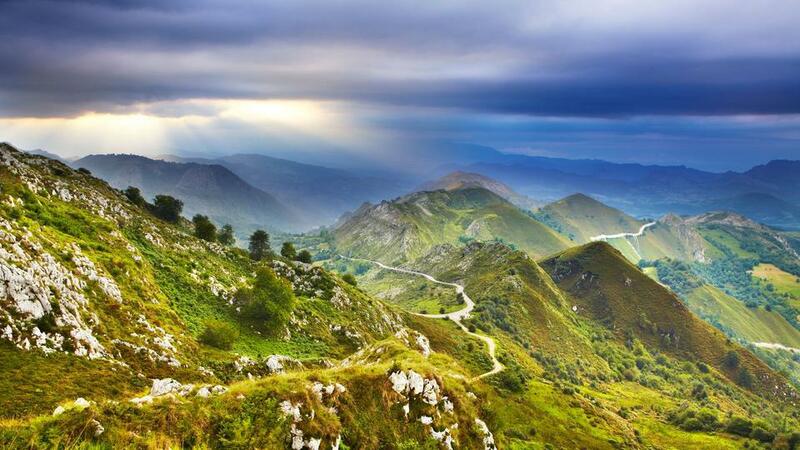 It's a symbol of the Way of St. James, The Camino de Santiago. This is the name for any of several pilgrimage routes to the Cathedral of Santiago de Compostela in northwestern Spain. This is where tradition holds the remains of St. James are interred. My friend invited me to start at their house, only a short distance from one of the pilgrimage paths through Germany. I'll wear the shell around my neck when I make the trek. A third thing I honor and respect in Islam is the discipline of prayer. I'm not aware of many in Christianity who pray five times a day, except perhaps monastics. Most Christians have even dispensed with grace at meals, except perhaps on special occasions. It's hard to pray together if you don't eat together, something Pope Francis would like to change. A fourth thing I honor and respect in Islam is the commitment to the unfortunate. A percentage of one's income is to be distributed to those in need. And there are other moral expectations in Islam I respect. Devout Muslims should refrain from gambling, thieving, lying, drinking intoxicants and being sexually promiscuous. The fact of the matter is, as a Christian, Muslims are my cousins. Their heritage goes back by way of Ishmael and Hagar to their forefather Abraham. As does the heritage of Christians and Jews, by way of Isaac and Sarah. We are all children of Abraham, created by the same Creator, who we know by different names. So all of the cousins need to call our stray siblings back into the fold of family gatherings. The Creator would love to see the whole family at peace, gathered at the same table once more. I thought I was about to say “no,” that I couldn’t make it downtown on a Friday morning. As I opened my mouth to speak, I heard my voice saying, “yes,” that I would be there. I had agreed to be the Jewish voice among clergy representatives to a press conference held to challenge the conscience of the president and of this nation. It was a gathering to demand an end to the raids throughout the country that began on January 2nd to round up Central American mothers and children who had come seeking asylum in America. Embarrassed within myself for my initial hesitation, grateful that my lips had known to form the word “yes,” the urgency to respond to yet one more issue, one more need of suffering human beings, was brought home. The span of human needs becomes one in the faces and voices of real people, and we are called to say “yes,” hineni/I am here. The sound of cracking voices and of tears softly shed echoed in the high vaulted ceilings of the church in which we gathered, Jews, Christians, and Muslims. A Guatemalan woman sobbed as she spoke through a translator, telling of her children’s fear that she would be deported. Her children are American citizens, and she is not. Another woman, a Unitarian minister now, spoke of her childhood in Chile, of the horrors under Pinochet, the terror of people being snatched from their homes at night, the “disappeared” of her own family who were never heard from again, the horror of realizing what would have been had she not found asylum in this country with her mother and grandmother. It is that horror of being snatched from one’s home in the night that is terrifying the immigrant community now. Another speaker pleaded with President Obama to shed tears and act with the same resolve for these children as he did in an effort to protect innocents from being slaughtered in the mayhem of gun violence. In the weekly Torah portion Va’era (Ex. 6:2-9:35), we are still enslaved, still waiting for Moses’ midnight call to go forth to freedom. We are still at the beginning of the Book of Exodus, but the stage is now set, set in the consciousness of what it is to be oppressed. The Hebrew name for the Book of Exodus is Sefer Sh’mot/the Book of Names. Living in the shadows, hiding in fear, terrified for the knock on the door, people dare not use their names. Refugees without papers become nameless and faceless except to God. Standing forth as a model and protector, God is named here in the beginning of the Book of Names. In the portion Va’era, God tells Moses the most holy name, formed of the Hebrew letters yud hey vav hey, the name of being and becoming, letters formed from the verb to be. As God is named, so every person is named in God’s image and calling. No human being is illegal, each one bearing the image of God, documented from birth as sacred and deserving of love and compassion. What about ISIS? What would you do about ISIS? This is a common refrain from those who doubt the power and effectiveness of nonviolence as a real world possibility. They often have a stereotype of any alternative to violence as a passive and permissive response. So here are some active steps, short of carpet bombing friend and foe alike, to stop those who call themselves the Islamic state. The strategy is two fold, both short and long term. Both paths are essential to keep the many headed beast with many names from shedding it's skin again and again and appearing in new and different guises. 1. Cut off the money! ISIS has expenses. It takes major funds to equip, arm and pay their fighters. ISIS has donors, primarily in the Gulf states, individuals if not governments. According to Peter Van Buren, former Foreign Service Officer in Iraq and writer at "We Meant Well," President Putin of Russia identified 40 countries that funded ISIS terrorist activities at the G20 summit. The list included some G20 countries. Van Buren also mentions that many believe, including Secretary of State Clinton in a 2009 message revealed by Wikileaks, that donors in Saudi Arabia were the "most significant source of funding to Sunni terrorist groups worldwide." Don't the U.S. have some clout with Saudi Arabia, where we just granted another $1.3 billion in weaponry? Since 1950, we've sent more than $80 billion in armaments their way. All this, while Saudi nationals brought down the twin towers, women were denied basic human rights like the right to vote, and beheadings, so sensationalized when done by ISIS, are common practice. On November 10, Saudi Arabia had already committed 151beheadings in 2015. 2. Stop the oil! 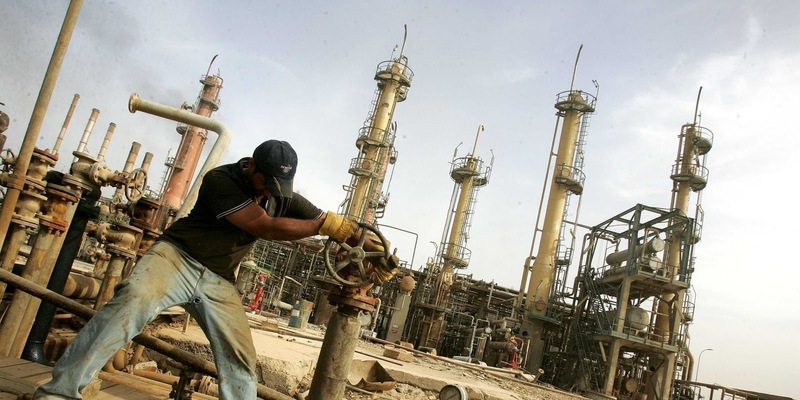 The other source of revenue for ISIS is oil. It's estimated that anywhere from one to four million dollars a day comes from oil sales. Oil has to get to market and someone has to buy it. With claims of precision bombing, what is preventing the destruction of marketing infrastructure? Most likely the oil leaves ISIS by way of Turkey and until recently little has been done to stop the flow. 3. Join the propaganda war! Instead of giving alternative voices air time, the mass media gives ISIS all the attention they want. For three days, NBC evening news spread fear and terror examining every last detail of the San Bernardino killings, doing their best to tie it to ISIS. In all of that air time they spent two or three minutes with the Imam, who knew the killers and was a proponent of peace. Why must our media do the work for ISIS? Why aren't we engaging in counter recruitment activities, in the mass media and on social media? Take that $1.3 billion dollars of weaponry to Saudi Arabia and turn it into propaganda depicting terrorists for what they really are, giving alternative Islamic voices a vehicle and refusing as a people to succumb to fear. The longer term strategy includes the following. It's basically a process of living our values. 1. 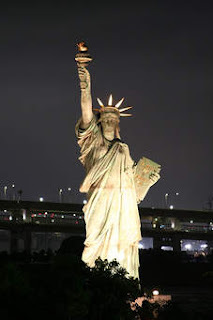 As is our national heritage, we could meet and greet, provide hospitality, welcome the foreigner, love the neighbor. 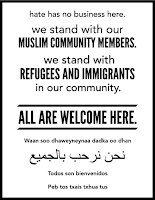 Restaurant owners in MN recently placed a sign in their window, "Hate Has No Business Here." 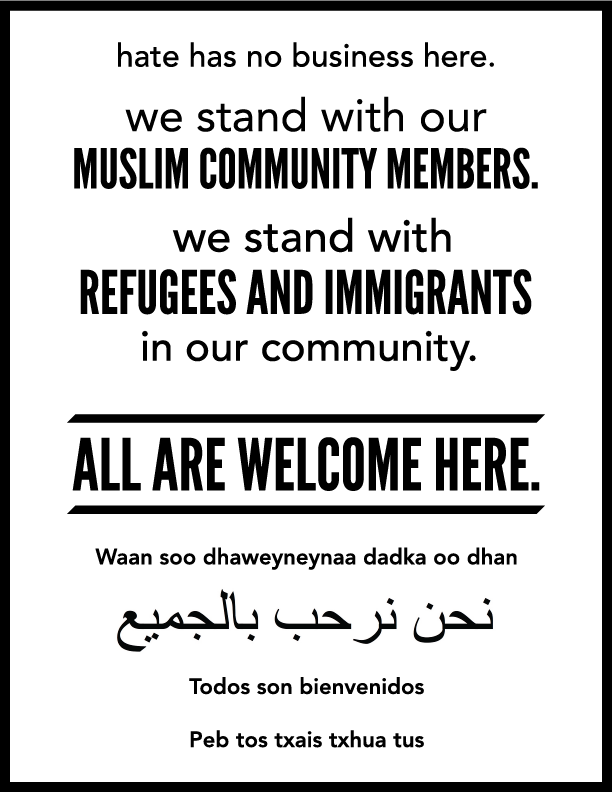 You may soon see posters like this in Brookings, SD as well as buttons that cross out hate. One could join an Inter Faith Dialogue group and learn about the similarities between religions. Perhaps you would make friends across religious barriers over a meal or coffee. 2. As is the Christian heritage, people could provide the works of mercy. It's estimated the U.S. has spent almost $6 trillion on wars against terrorism. One wonders how much good will that might have earned in the minds of those without clean water, nutritional food, decent shelter and meaningful work. For instance, terror is on a rampage in Honduras. There's no mercy there. It's the murder capital of the world. 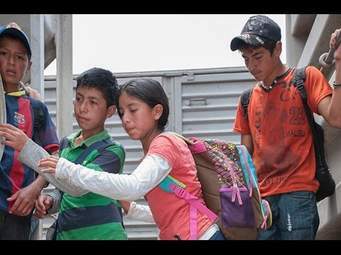 And yet Mexico and the U.S. in 2015 have sent 7,000 migrant Honduran children back to an uncertain future. 9,000 were deported from the U.S. in 2014. And of course, according to some, 5 year old orphans from Syria are not welcome here. 3. We could reform our economic system and the way we allow huge multinationals and financial institutions to determine our foreign and domestic policy. As long as the golden rule is twisted into "those who have the gold make the rules," we will continue to export exploitation and poverty abroad and dig deeper graves for many at home. There are any number of ways ISIS can be countered. The only limit is willingness to use imagination, intelligence and wisdom, as distinct from the force of arms. There are times in history where people doubt that the "arc of the universe bends toward justice." But then human beings are often short lived and therefore short sighted. Terrorists and bullies may have their day in the limelight. But there are deeper and quieter forces at work that spring from human history and human hearts. In the end, these forces will have their way. Yesterday I got to go see my cousin’s newborn baby for the first time – 2 weeks old. As a teacher I’m around kids a lot but newborns rarely. I’d forgotten how small and helpless they are. Did you know babies’ brains don’t even begin to see color until about 3-4 months old? Watching little Isabella Rose beg to be fed, I was struck anew by the story that gets told a lot this time of year, of Christmas: God chose to send his son as a completely helpless baby. 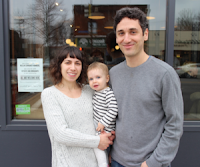 Aside from crying, there is nothing a baby can do to get her needs met. She is entirely dependent on others to care for her and keep her alive. And luckily Isabella Rose has parents who are doing a great job of keeping her alive right now. However, I hate and reject this question because Tamir was not responsible for saving his life in that moment. The police are the ones who are charged with protecting lives – all lives, even black lives. It is their job. As a teacher it is my job to ensure that kids learn. It doesn’t matter if kids are restless, confused, or hungry, it is my job. It is still my job when kids are disrespectful or disengaged. It is still my job when kids are not following the rules. It is my job. As an adult. As the one who has been trained and privileged with control, I work to make sure every student learns because it is my job. I will get a stretch band for the restless student. I will reteach skills in a new way for the one who’s confused. I will feed the hungry student. I will teach respect and work harder to create exciting lessons. I will do everything I can to create an environment where my students succeed, because that is MY job not theirs. Do I have 100% control of outcome? Absolutely not. But I do have 100% control of how I do my job. In the same way it was not Tamir Rice’s job to protect the community and himself. It is the police’s job. 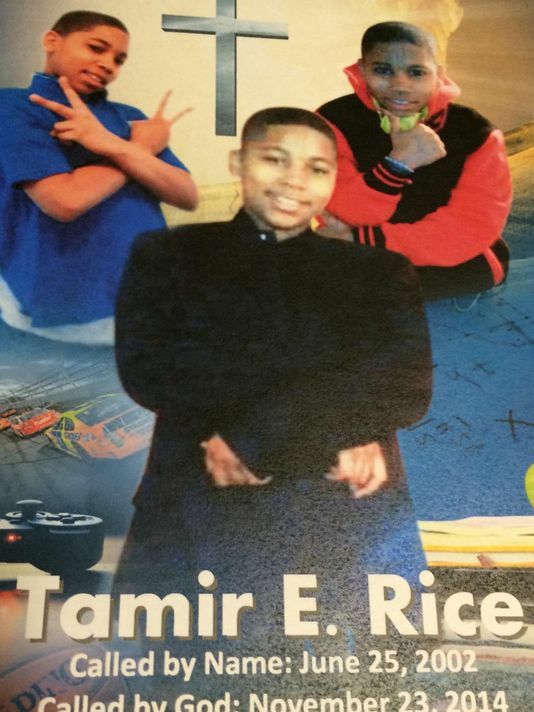 Tamir Rice was a child. Regardless if you think playing with a toy gun in a public place is a “good choice” or not (it was certainly not illegal), Tamir Rice was a child not a police man. Regardless if you think he didn’t respond quickly enough to the police man, Tamir Rice was a child not a police man. It is the police man’s job to know how to keep everyone safe, including the boy with the [toy] gun. It is the police’s job to know the laws and to enact them faithfully. It is the police’s job to be judicious and cautious and calm in responding to calls and keeping every body safe. Their job. They failed. (They also failed to give CPR as Tamir lay there dying.) Tamir was a child, in a park, playing and that was his only job. And so I reject any question or argument that shifts responsibility from the police to Tamir. Sure, it is always easier to find fault outside of your own self, your own people. It is easier to blame, especially when you have been taught to see black bodies as less worthy, less capable, and less human. You don’t even realize you’re doing it. It can even “seem” logical. But in the end it doesn’t matter what Tamir Rice could have / should have done to save his own life. That was not his job. If Christians believe it is significant that God chose to transform the world by incarnating Godself in the form of an innocent, helpless babe, we must also recognize God was incarnate in the life of Tamir Rice, a child helpless to the powers of American racism. And so James Cone’s declaration that “God is Black” is all the more powerful today. “God is Black,” he writes, “not just because African-Americans are Black, but because God freely chooses to be known as the One who liberates victims from their oppression.” Perhaps this is uncomfortable for some to compare Jesus to a young, black male in Cleveland, Ohio but Jesus was always going around aligning himself with the despised and oppressed – the lame, the prostitutes, the tax-collectors, the Gentiles, you name it. In the face of oppression and a world that told these people they were unwanted and unworthy, Jesus was their friend. He spoke for them. He challenged authority for them. And his liberating message got him killed. But death has never been the end of the story. Jesus overcame the grave and I pray Tamir Rice’s life and death will lead to a positive change in white hearts and in our shared world. Cone writes that “God is that life-giving power who enables the victims of injustice to survive in the midst of misery and to fight on until freedom comes.” There is no question here who the victims of injustice are or the source of our current misery. The fact that no one was really surprised at the lack of an indictment reveals as much. Yet, according to Cone, God is the life-giving power which enables the fight for freedom to continue instead of sinking into the all too realistic sense of despair. I have witnessed this life-giving power alive in many who use these horrendous circumstances to continue to advocate for justice in their communities and in friends who allow their eyes to be opened to acknowledge systems of privilege and oppression in their own lives. Keep it up. However, tonight I struggle to find an adequate personal response in the midst of misery. And so, as a white female, I want to leave you today with the one life-giving thing I have: a prayer of confession. This prayer is from a liturgy I used to pray in college with friends working for justice in the LGBTQ community. I invite you to join me in this prayer; may our confessing lead to liberation. For until freedom comes, we have much to confess. LORD hear our prayer. O God, we confess that the circle of love is repeatedly broken because of our sin of exclusion. Sometimes we live in both circles at once, and we don’t know which way to turn. We confess that the circle of love is broken whenever their is alienation, whenever there is misunderstanding, whenever there is insensitivity or a hardening of the heart. We confess that the circle of love is broken whenever we cannot see eye to eye, whenever we cannot link hand to hand, whenever we cannot live heart to heart and affirm each other.